"Invest in Duqm" promotional campaign, organized by the Special Economic Zone Authority in Duqm (SEZAD) in China, has moved to its second phase, targeting specific investors representing a number of Chinese companies invited earlier to attend a seminar on the Special Economic Zone in Duqm (SEZD). The seminar, held in Dalian, China, focused on the incentives offered by SEZAD, the projects in SEZD and the investment climate in the Sultanate in general. H.E. Yahya bin Said Al-Jabri, SEZAD Chair, indicated that the investment opportunities offered by SEZD are promising, stressing the importance of SEZD geographic location. In a speech during the seminar, Al-Jabri stated that Duqm is an intermediate hub linking the Middle East markets such as China, with its large population, impressive industrial development, heavy production of goods, competitive prices and Western markets in the United States and Europe. He pointed out that Duqm, with its geographical location on the Indian Ocean, is the gateway to the Arabian Gulf and Iran and an important and safe port for the export of goods to the markets of India and East Africa. He called on Chinese companies to explore the investment opportunities available in Duqm asserting SEZAD full support to the companies wishing to invest in SEZD. 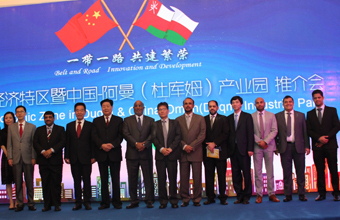 He thanked the Ningxia Provincial Government for its great support to SEZAD and Wanfang Company for its efforts in organizing the seminar as well as the partners participating in the promotional campaign, namely Duqm Port, Oman Oil Company (OOC) and the Public Authority for Investment Promotion and Export Development (Ithraa). The seminar included a number of presentations that focused on the investment constituents in Duqm. Said bin Homoud Al-Ma'wali, General Manager of Oman Tank Terminal Company (OTTCO), an OOC company, indicated that OOC would establish a number of projects in SEZD. These would include an oil refinery, a center for oil storage and a number of other projects, explaining that these projects would create great economic value for SEZD and encourage companies to invest in Duqm. For his part, Jalal Al-Lawati, Director of the Promotion Department in SEZAD, said that the geographic location of Duqm strongly imposes itself and prepares SEZD to attract various investments. He also pointed to a number of investment elements in SEZD and the incentives offered by SEZAD. He highlighted a number of projects underway in Duqm. Ali Shah, Chair of Wanfang Oman Company, highlighted some projects the company would establish in SEZD supported by Ningxia Region. He said, "We are looking forward to more Chinese investments in Duqm. Duqm is an important choice for Chinese companies on the Indian Ocean." Nasr bin Zahir Al-Hadhrami, Investment and Promotion Executive in Ithraa, gave a presentation on the investment climate in the Sultanate in general. He said that the Sultanate is a promising destination for investments and characterized by the existence of various investment zones including a number of free and industrial zones, pointing out that the Sultanate is continuously working to modernize its laws and investment legislation in line with global changes and economic growth. Ithraa participation in the promotion is part of its efforts to promote the Sultanate as a destination for investment and business and to introduce the investment environment and promising sectors. Representatives of the Chinese companies attending the seminar sought to know SEZD characteristics that distinguish it from other locations, wondering about its future role in regional and global trade and re-export, and whether taxes were imposed on investors in Duqm. SEZAD officials confirmed that investments in SEZD enjoy tax exemptions and that SEZD has a number of infrastructure that will enable it to play a pivotal role in world trade in the future.